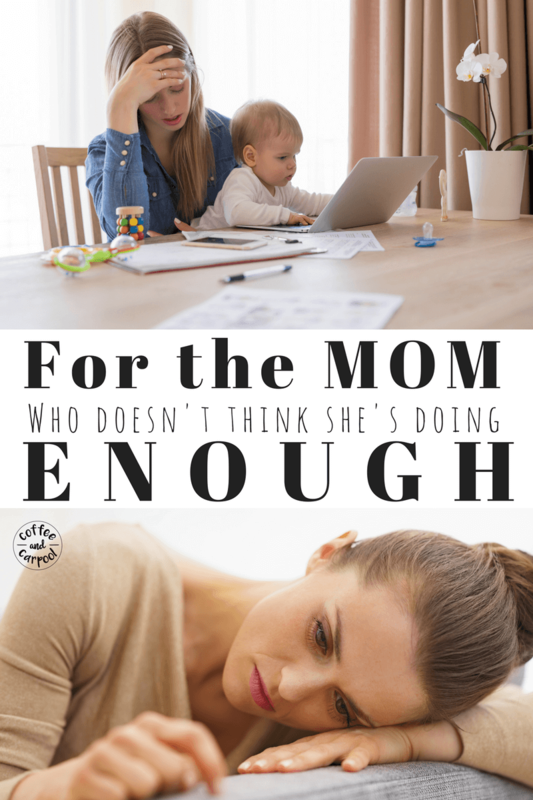 Inside: Have you ever been overwhelmed as a mom, juggling too many things and wondered am I enough? Am I doing enough? 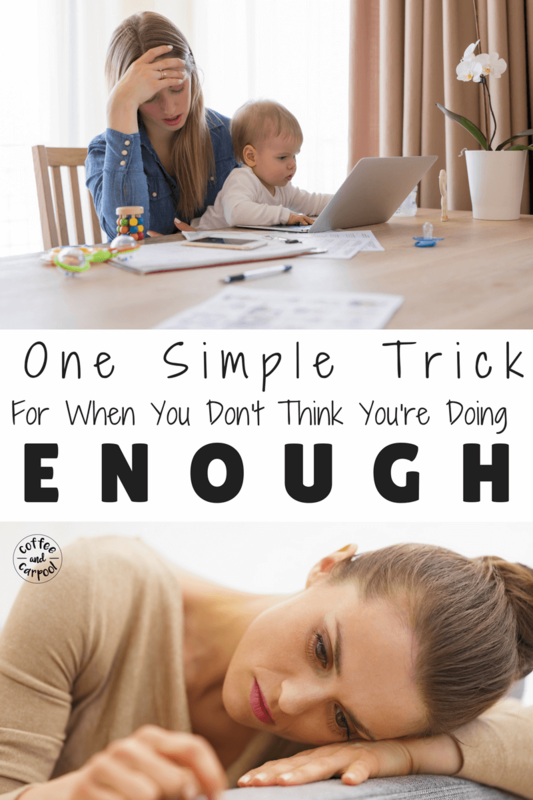 When the self-doubt creeps in, you need this one simple trick to get your mom mind back on track that you are in fact doing enough. I sat on the edge of my bed, with my knees tucked under my chin and tried to take a deep breath. I’m too overwhelmed to even cry about what happened. I’m still trying to process it and figure out how it happened. Some days, I feel like I’ve got it all together as a mom. Juggling all the balls and keeping them in the air. I’m balancing parenting and household chores and schoolwork and our family calendar and carpooling to extracurricular activities and work. And it feels ok most days. I feel semi-accomplished and quasi-successful. I dropped all the balls I was just yesterday managing to juggle. And I’m mad at myself and annoyed and truth be told, a little embarrassed. I double booked a playdate. And because I wasn’t paying attention, I triple booked it. I made a mistake at work and felt foolish. I forgot a dear friend’s birthday. I forgot to change the load and now the baseball jersey that has to be worn in a few minutes is wet and mildewy. Honestly, if only one of those things happened, I would be fine. I could handle it. But when it all happens at once—and it always seems to happen all at once—the overwhelming realization that I can’t do it all—that I am not doing enough to handle it all—hits me like a ton of bricks. It brings me to my bed with my knees tucked in and I have to admit to myself I can’t do it all. I am only one person and I am not superhuman, even if my kids think I am. Something is going to give, in addition to my sanity and my puffed up ego thinking I had all my stuff pulled together. And then I think, maybe it’s me. Maybe I’m not enough. It’s an isolating and self-deprecating feeling. This negative self-talk and fear can paralyze me into inaction. My usually fast moving, fast thinking self all of a sudden has the inability to move forward or do anything. I sit there, surrounded by my self-doubt. But there is a way to turn this moment around. I walk to my bathroom and read a note I left for myself for moments like this. 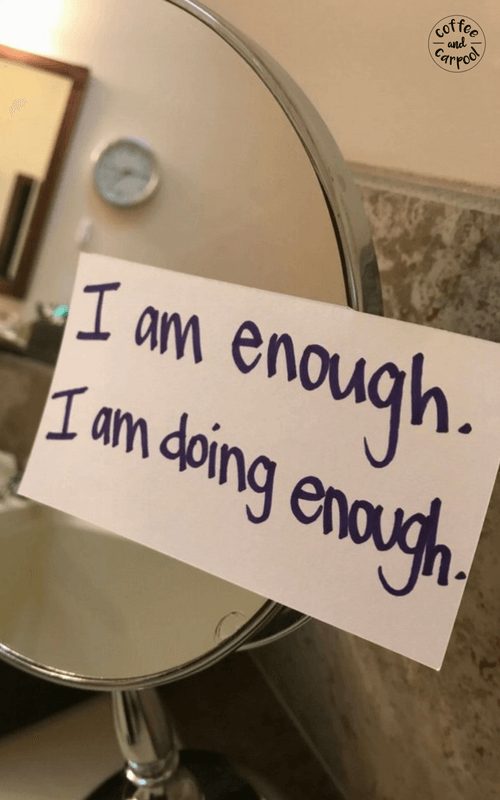 On an index card taped to my bathroom mirror and on my computer and in my car I have three simple words that remind me daily to do my best as a mom and as a wife and as a homeowner and as a friend. 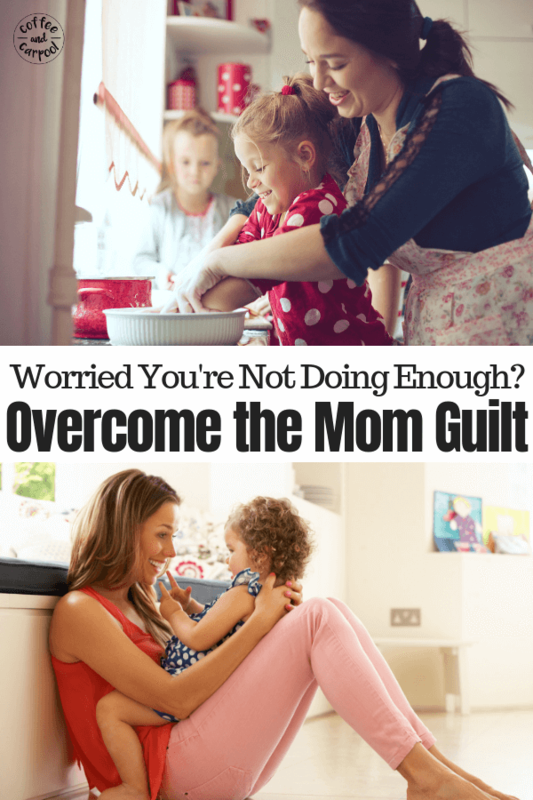 You need to read these three words whenever you feel like you’re not doing enough as a mom. Because these three words give me the inner strength I need as a mom to get through my toughest days. And for good measure: I am doing enough. Because some days, I make the homemade dinner. And some days we eat frozen pizza. I am doing enough. Some days I am on time and other days I am perpetually five minutes late. I am doing enough. Some days I volunteer at my kids’ school and other days I let the other parents have at it. I am doing enough. Some days my bed is made and other days you can’t see my floor through the piles of dirty laundry. I am doing enough. Some days I make my kids’ lunches and even remember to cut the crusts off. Other days they eat cafeteria hot lunch. I am doing enough. Some days I shower and moisturize and have the energy to put on makeup. Other days I stay in workout clothes I never worked out in. I am doing enough. Some days I snuggle with my kids and read a book to each of them in their beds. Other days, the oldest reads to the youngest and they get a quick kiss. I am doing enough. When you’re a mom you’ll always be juggling too many balls. So balls will inevitably drop. There will probably never be enough time or money or energy or patience. But you? You will always be enough. You will always do enough. 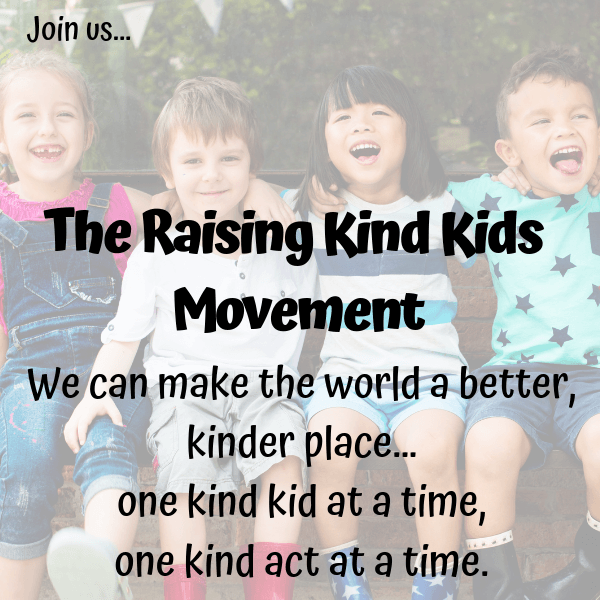 Even on those dirty laundry pile, cafeteria hot lunch, no shower, running late kind of days. Now you just have to remind yourself to stock up on Febreeze and frozen pizzas. Do you want something prettier than an index card or a notepad with these words you need to see? Here are 6 prettier versions you can print for free. Print the one you like best, frame it and then put it somewhere you will see it daily. Read the words. Know that you are enough. You are doing enough. What do you do to help yourself get through the extra tough days? I usually turn to my friends. What a familiar feeling! My son is 2 and I constantly feel that I’m not doing enough and that I don’t have enough time for things. It also doesn’t help that my husband is out of work so I’m making all the money by working from home. But I always feel proud of myself when I manage to do everything, including have a long walk with my son, work, housecleaning, and have a Chinese class in the evening. Definitely not… sometimes you just got to do what you’ve got to do! I feel like this too! Great post. Authentic and endearing, this post perfectly depicts both the challenges and the grace of modern living. It seems so simple to just stop trying to live up to everyone else’s expectations of what I SHOULD do. But it’s not. 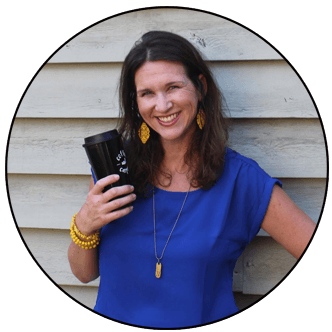 Until I realized that the only person’s judgment that matters is my own, I felt like a hamster on a wheel and in a state of near-constant failure. Now, I do what I can, when I can, and try and be aware of when I feel that sense of “obligation.” Anything I do out of obligation isn’t done with a full heart. So, I’m conscious of that and try and adjust. I love your messages to yourself. You and I are enough. Sometimes it’s easy to forget, and your post is a great reminder. What a kind sentiment. Thank you! It is so easy to forget that we are enough when we’re doing what we “should” be doing. I’m a recovering perfectionist so it’s something I struggle with often! Absolutely! Mom guilt and jugggling is real. I wish their was a magic bullet. This is as close as I’ve come to finding one! This is awesome. For a while I was struggling with trying to be everything and do everything for family. I am learning I am enough. I never had the words for it … but you said it beautifully. I am enough. 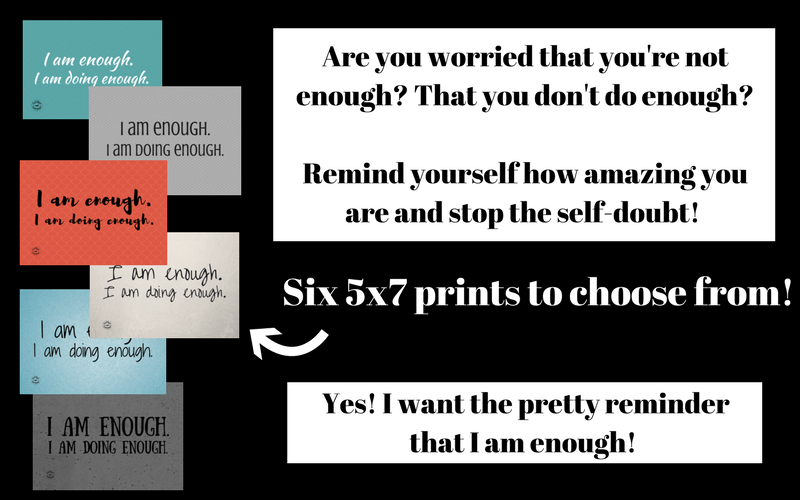 You are definitely enough… you just need to remember it. Especially on the tough days. Totally been there…actually I was there on Friday. Overbooked myself and my kiddos and then felt like I let everyone down. It reminded me that we really don’t have to do everything and be everywhere we are invited. It would have been much less dissappointing to have said no in the first place and enjoyed our time together rather than be left feeling like we were flaking out. It’s so hard to remember we don’t have to say “yes” to everything and be everywhere!! So much truth here. Thanks for putting words to what we all feel but forget to remember. Here’s my story of a crazy Sunday morning – with a bit of perspective by the end. Great read! I wonder if I am doing enough often – I’ll have to try your index card tip! You are enough. You just need the reminder…..
You are definitely NOT alone. You are doing enough. You are enough. Hang in there.